Like it or not, people will judge a party by the food you serve. People want to eat something tasty and high quality – something where they can picture you slaving over a hot stove for hours and hours to serve them a food that tastes just right. OK, maybe not that last part, but people definitely want to eat good food. One easy way to have delicious appetizers for your guests to eat is by stopping in your grocery stores’ freezer aisle and picking up one of Nancy’s Appetizers. 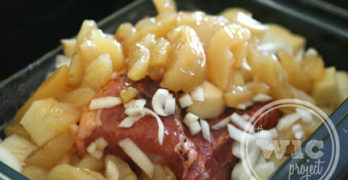 Nancy’s Frozen Appetizers & Desserts was founded by Nancy Muller, who was known in social circles for her homemade, bite-size appetizers. Starting in the Bay Area, Nancy’s has spread across the US, bringing easy-to-prepare party food options to us East-Coasters as well. 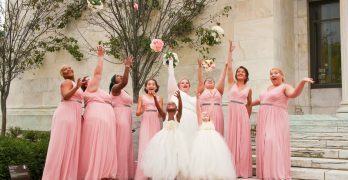 Nancy’s offers several different options to help serve your guests tasty treats. The have 8 different appetizers (petite quiches, deli spirals, mushroom turnovers, soufflés, feta stars, and seafood crab cakes), 4 entrees (quiches), and 2 yummy desserts (chocolate and pecan petite tarts) that can all be prepared by either baking or some of them even just thawing! 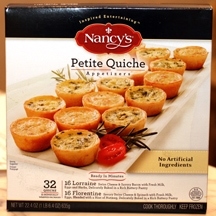 I picked up a 32-pack of Nancy’s Petite Quiches, which includes 16 Quiche Lorraine and 16 Quiche Florentine. The Quiche Lorraine is described as “Swiss cheese and savory bacon with fresh milk, eggs and herbs, delicately baked in a rich buttery pastry” and the Florentine is “Savory Swiss cheese and spinach with fresh milk, eggs, blended with a hint of nutmeg, delicately baked in a rich butter pastry.” When you open the box, you’ll see that all of the mini quiches are securely packaged in the tray. This prevented crusts from breaking or flaking off, ensuring that each one is still whole when it goes into the oven. After the kids helpfully placed all 32 quiches into a pan, it was ready for baking. 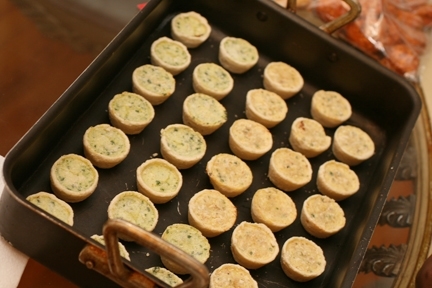 True to form, our oven required an extra 5 minutes of baking to get the petite quiches golden & crispy. 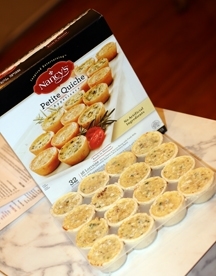 If you are super short on time, the petite quiches can also be microwaved. Once cooled, the seven of us dug into Nancy’s appetizers. The dough is definitely buttery (as advertised) but it wasn’t overly greasy or heavy. The egg mixtures baked up perfectly and weren’t runny or too tough. While both of the appetizers are quiches and both of them are made using eggs, it was interesting to taste the two totally different flavors between the two. To me, the Quiche Lorraine reminded me of hot breakfasts, with the bacon and egg flavors, while the Quiche Florentine reminded me of a hot omelet dinner, with the subtle bite of spinach flavors. My personal favorite between the two was the Quiche Lorraine – I loved the bacon that you would taste in each bite. I probably ate 6 or 7 of the Quiche Lorraine while the other testers finished up the Florentine. Incidentally, in addition to parties, these are also perfect for late night snacking. One night, I was totally craving SOMETHING to eat, but didn’t want a lot. I took a couple of the left over petite quiches, heated them up, and it was the perfect amount of food for my late night hunger pangs. 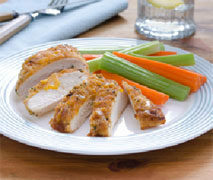 Ranging from $3.99 to $12.99 per package (depending on product size & your store) Nancy’s appetizers are very affordable. To find out where you can buy Nancy’s products, you can use their website’s locator tool. In addition, the Nancy’s website also has several delicious recipes for various dips and sauces that will complement their appetizer product line. If you’re looking for easy to serve appetizers for your guests, I would definitely suggest trying Nancy’s. You can also enter to win the WCatDD Nancy’s Appetizers Giveaway! 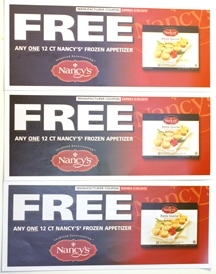 One winner will receive THREE coupons for a FREE 12 count Nancy’s frozen appetizer. Disclaimer: This post consists of my (and/or fellow tester) opinions only. No compensation was given for this review/giveaway. I did receive a coupon for a free 12 count of Nancy’s Appetizers from the manufacturer or their representing PR agency to use and test for the purposes of this review. This did not affect the outcome of this review. I'd like to try the black tie trumpets. thanks for the chance. I'd like to try and serve the Cheese Souffles. I think their Black-Tie Beef Wellingtons would be a hit at our next gathering! I love to take the Petite Quiche to parties. The Black Tie Trumpets sound great. Thanks for the chance. I would love to serve the Deli Spirals, thanks! The Deli Spirals look absolutely AMAZING! I'd love to offer the Petite Quiche to my guests. I like to bake, but those Petite Tarts in Chocolate look like something I couldn't pass up buying. Will definitely be looking for those on my next trip to the store. I would want the Petit Quiche! Yum!! The Black-Tie Beef Wellingtons sound devine! I would totally serve those!